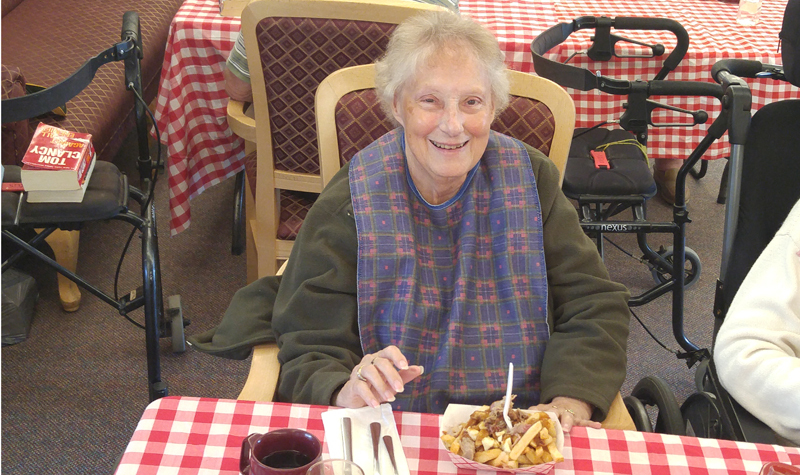 Resident Lorna Hillan enjoys a plate of poutine at Springdale Country Manor on Sept. 5. SPRINGVILLE, Ont. – Springdale Country Manor residents recently requested poutine for lunch, so that’s what they got on Sept. 5. In fact, the Peterborough-area long-term care home’s staff members even arranged for a chip truck to pull up to the home over the lunch hour that day to dish up residents’ orders. Life enrichment co-ordinator Sonia Murney says she has recently received notes left on her desk from staff members to let her know that residents have been asking about getting poutine served for lunch. “So, I thought, OK, let’s get them poutine, then,” Sonia tells The OMNIway. Sonia looked around for a company that could bring a chip truck to Springdale and found Personal Touch Catering and Events in Millbrook. Just before noon, the Personal Touch chip truck pulled up to Springdale Country Manor, and staff members diligently took residents’ orders. Staff members picked up trays covered with individual portions of fries, cheese curd and gravy and brought them back to residents in the dining room. Some of the more adventurous residents opted to have pulled pork added to their poutine. Sonia says food is important to long-term care residents, and Springdale Country Manor always tries to cater to residents’ meal requests. A favourite outing, she adds, is the monthly visit to the nearby Golden Wheel Chinese restaurant. Offering poutine from a chip truck was something different, and the residents enjoyed that aspect of lunch that day, Sonia says. There was another benefit of offering poutine, she says: it’s easily pureed, which meant all residents could enjoy it. In fact, staff members even noted that they enjoyed trying pureed poutine. Springdale Country Manor has two dining rooms, but during the poutine lunch everyone sat together in the front dining room, which added a pleasant social aspect, Sonia says. “It was nice for the residents to have different people to sit with, and the residents were really interacting,” she says.